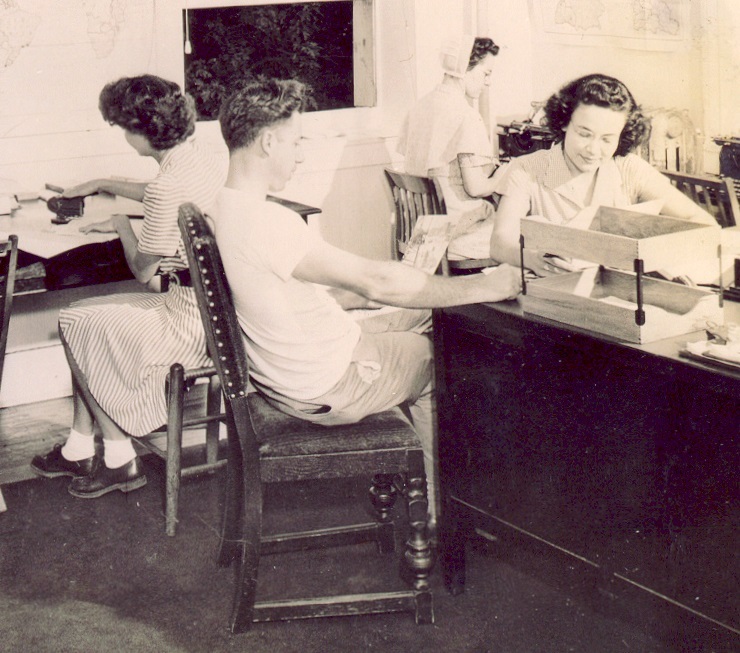 The Brethren Service Center in New Windsor, Maryland, March 1947. The gym in center of picture is where much of the post-World War II relief work was carried out. Photo courtesy of Howard Lord. As noted in my post of May 22, many a seagoing cowboy and cowboy supervisor ended up spending time at the Brethren Service Center in New Windsor, Maryland, while waiting on his ship to sail. The seagoing cowboy office was located there, along with a swarm of activity related to other Church of the Brethren relief programs. Ernest Bachman, supervisor of the SS John J. Crittenden crew of November 1945, noted that his men were assigned the task of raking leaves. J. O. Yoder’s time at New Windsor overlapped with Bachman. Yoder arrived on November 13 and was surprised to meet Carol Stine from his home town in Goshen, Indiana, working there as a secretary for the seagoing cowboy program. After that, he didn’t stand a chance. 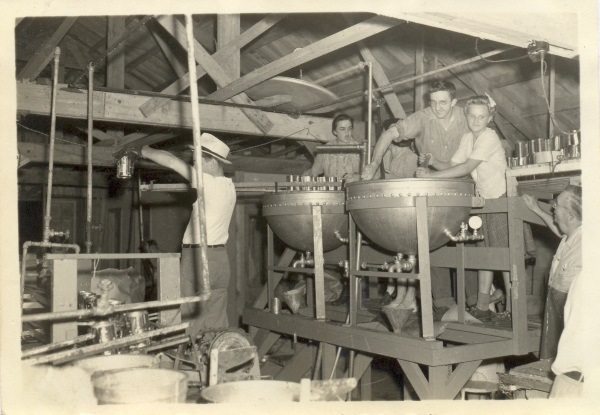 Carol Stine, right, works out details for a seagoing cowboy. Photo courtesy of Brethren Historical Library and Archives. Sunday at the Center provided a day of rest. Yoder skipped church, “as I ain’t got a suit [with me],” he quipped in his journal. “I played the victrola in lounge and enjoyed it very much – Bolero, Lord’s Prayer, etc.” He went out to the nearby Roger Roop farm in the afternoon to see the Heifer Project cattle collected there for shipping. Later that night, he reveled in a game of Rook with a group of Kansas seagoing cowboys. 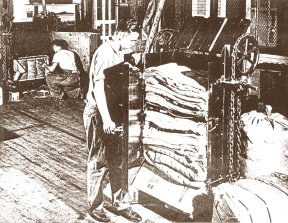 Volunteers bale and package used clothing to send to Europe after World War II. Photo courtesy of Brethren Historical Library and Archives. 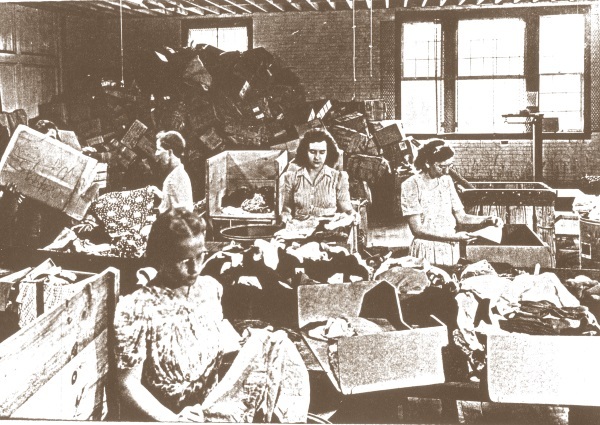 Women sort relief clothing to be sent to Europe. Photo courtesy of Brethren Historical Library and Archives. Later, he helped prepare shipping cases for old shoes that had been rebuilt at the Center. “Nearly 40 cases containing from 85 to 150 pr. shoes are ready for shipping,” he wrote. Volunteers repair used shoes sent to the Brethren Service Center after World War II. Photo courtesy of Brethren Historical Library and Archives. Other days found him helping carry boxes in the food canning department or helping Carol Stine sort cowboy application blanks. Volunteers help can food to be sent to Europe. Photo courtesy of Kenneth West. Canned food ready to box for Europe. Photo courtesy of Kenneth West. Yoder’s three weeks spent at the Center weren’t all work and no play, however. Evenings were filled with games of checkers, Chinese checkers, jigsaw puzzles, singing around the piano, folk game activities, reading, and writing letters. Finally, on Monday, December 3, Yoder had his orders to report to New York City where he would lead the cowboy crew of the SS Clarksville Victory on their journey to Poland. There, he would have the opportunity to see firsthand the devastation which Ora Zeigler had described.